Filefish are members of the Monacanthidae family, which contains approximately 27 genera and 102 species. They are very closely related to pufferfish and triggerfish. Filefish are a commonly kept group of fishes due to their fascinating behaviors, ease of care and unique cryptic patterning. The Aiptasia Easting Filefish (Acreichthys tomentosus) is one of the most commonly sold filefish species. It is highly sought after due to its tendency to consume the pest anemone Aiptasia sp. In aquariums. Filefish are found in the Atlantic, Pacific and Indian Oceans. They are an extremely diverse group, ranging in size from 5” (12 cm) to 45” (114 cm), though most species mature at about the middle of that range. Filefish present a wide array of life styles and dietary preferences. Most filefish have very cryptic patterning, designed to help them blend perfectly into the vegetation within which they hide. Filefish pairs will form during spawning season, and the eggs are typically deposited in a nest constructed by the male. In some species, both parents will guard the developing nest, in other species only the male remains behind to do the job. Filefish can make great aquarium inhabitants, provided their husbandry needs such as diet, water quality and tank space are met. Filefish prefer a temperature range of 72F (22C) to 80F (26C). 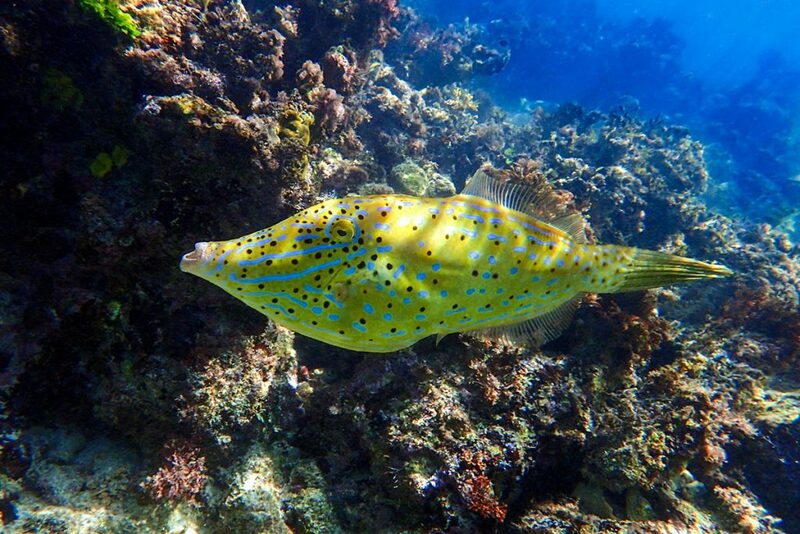 Filefish are generally not considered reef safe. While some species can be kept in reef tanks with no issues, others are known to consume corals. It is important to consider carefully what species of filefish may be best for your aquarium. While some species such as the Aiptasia Easting Filefish (Acreichthys tomentosus) have a good track record in captivity, other species such as the Orangespotted Filefish (Oxymonacanthus longirostris) typically require coral polyp to feed upon, which can cause some difficulty in long term maintenance.